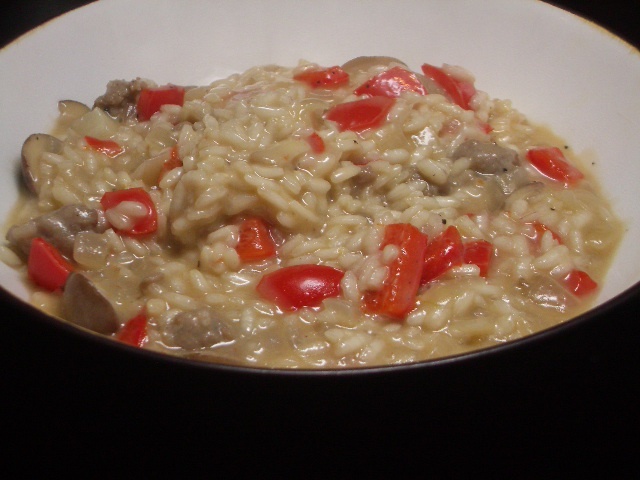 You should view the add-ins to this risotto as suggestions: the beauty of the dish is that you can use all those fresh veggies or meats in the fridge before they go bad. We left out the pancetta and the parsley just because we didn’t have those in our fridge, but as we say, add and subtract as it suits for you- this will still be delicious. This is a recipe from Giada on FoodNetwork, and you find the original page here. In a large heavy saucepan, melt the butter over medium heat. Add the sausage and saute until golden brown, about 5 minutes. Add the onion, bell pepper, and mushrooms and saute until tender, scraping up the browned bits on the bottom of the pan, about 8 minutes. Season with salt and pepper. Add the rice and stir to coat. Add the wine and simmer until the wine has almost completely evaporated, about 1 minute. Add 1/2 cup of simmering broth and stir until almost completely absorbed, about 2 minutes. Continue cooking the rice, adding the broth 1/2 cup at a time, stirring constantly and allowing each addition of broth to absorb before adding the next, until the rice is tender but still firm to the bite and the mixture is creamy, about 25 to 30 minutes total. Remove from the heat. Stir in 3/4 of the Parmesan. Transfer the risotto to a serving bowl. Sprinkle in the remaining parmesan and ENJOY!